Is it a music video? Is it an educational short film? Is it creative?… Though definitely less innovative than Not The Same, Evelyn or I’ve Seen Enough in terms of pick-the-instruments-you-want-to-hear technique, making use of only the enabling /disabling buttons artifact, we thought this pseudo promo does hold its own regarding creativity. 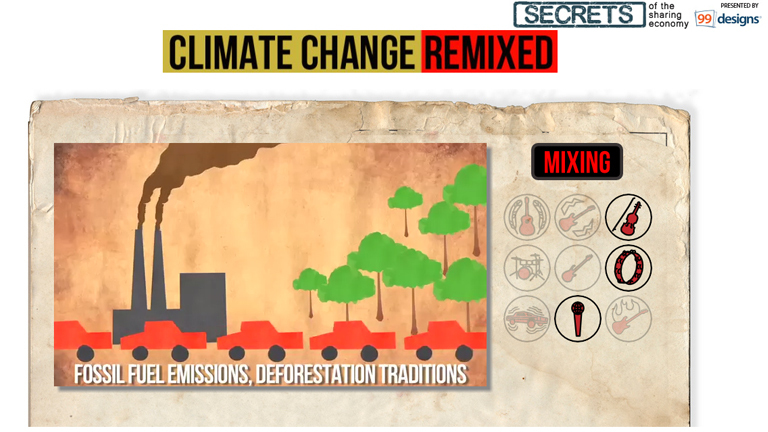 It’s not very often we see a group explore an interactive music video format in order to deliver an important social message (such as the the effects of the climate changes!). So kudos to Explainer Music and PandoDaily for delivering us worth-knowing environmental messages in a fresh, fun-to-watch manner! Bonus for talented composers: a link to the separate audio files which they can use to create their own mix, to be shared later with the band! Not a fan of interactive vids? Enjoy a linear version here. Though definitely less innovative than Not The Same, Evelyn or I’ve Seen Enough in terms of pick-the-instruments-you-want-to-hear technique, making use of only the enabling /disabling buttons artifact, we thought this pseudo promo does hold its own regarding creativity. It’s not very often we see a group explore an interactive music video format in order to deliver an important social message (such as the the effects of the climate changes!). So kudos to Explainer Music and PandoDaily for delivering us worth-knowing environmental messages in a fresh, fun-to-watch manner! Bonus for talented composers: a link to the separate audio files which they can use to create their own mix, to be shared later with the band! Not a fan of interactive vids? Enjoy a linear version here.